Ziggurat (looking southwest), Ur (modern Tell Muqayyar), Iraq, ca. 2100 BCE. After the Gutians took power from the Akkadians around 2150 BCE, the Sumerians rose up and wrested control from the alien Gutians and established the Neo-Sumerian state, also known as the Third Dynasty of Ur. The most imposing structure of the Third Dynasty is this ziggurat. It has a massive mud-brick base that is 50 feet high with three ramplike stairways of a hundred steps each that probably led to another flight of steps which led to the temple that has not survived. 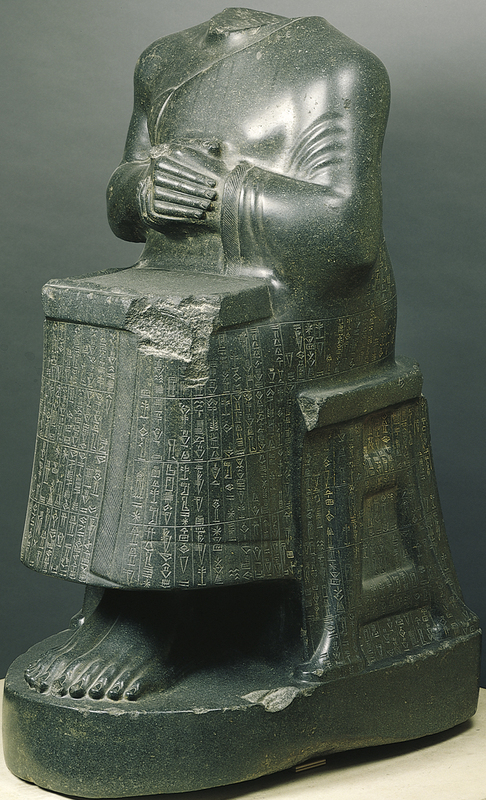 Gudea seated, holding the plan of a temple, from Girsu (modern Telloh), Iraq, ca. 2100 BCE. Diorite, 2′ 5″ high. Musée du Louvre, Paris. Gudea was the ruler of Lagash around 2100 BCE and he spent many riches building or rebuilding temples and placing sculptures of himself in each one. His statues tend to have a standard form, he is either sitting or standing with his hands tightly clasped, his head is shaven and sometimes has a brimmed sheepskin hat, and he’s always wearing a long garment that leaves one shoulder and arm exposed. Gudea was zealous in granting the gods their due and his statues act as an endearing testimony to his piety, as well as his wealth and pride. The statues are made of a rare and costly dark stone called diorite that is extremely hard and difficult to carve, adding to the prestige of his portraits, “This statute has not been made from silver nor lapis lazuli, nor from copper nor from lead, nor yet from bronze; it is made of diorite.” This statue is unique in that it has a temple plan drawn on a tablet on his lap. 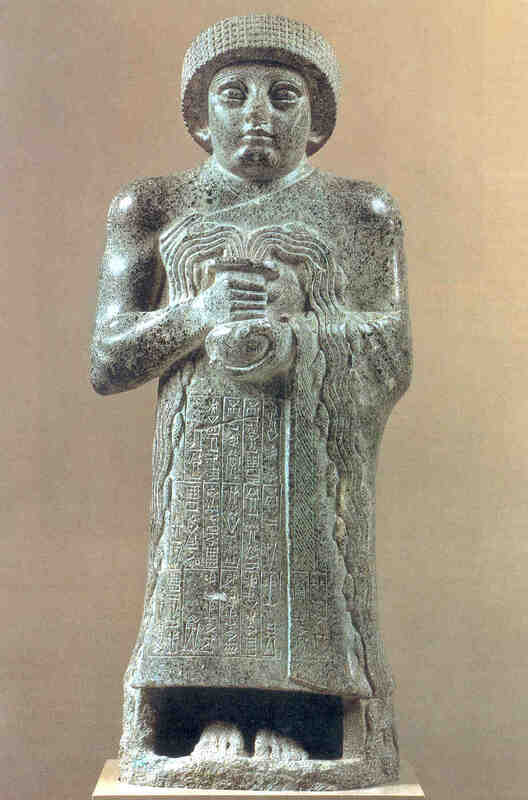 Gudea standing, holding an overflowing water jar, from the Temple of Geshtinanna, Girsu (modern Telloh), Iraq, ca. 2100 BCE. Calcite, 2′ 3/8″ high. Musée du Louvre, Paris. Many of Gudea’s commissioned statues bear inscriptions with messages to the gods of Sumer and clarifications of why he was portrayed the way he was: “I am the shepherd loved by my king [Nigirsu, the god of Girsu]; may my life be prolonged,” and “Gudea, the builder of the temple, has been given life.” His large chest is a sign the gods have given him fullness of life, his muscular arms reveal his god-given strength, and his large eyes signify that his gaze is perpetually fixed on the gods. This statue differs from the other statues in that he is holding a jar with free-flowing water, complete with swimming fish, coming out in two streams running down each side of his cloak. Gods and goddesses are often portrayed in the same manner, holding similar overflowing jars symbolizing the prosperity they bring to their people. This is the only known instance where a Mesopotamian ruler is shown as the source of the prosperity.